He voice hope that the resolution will lay the groundwork for a presidential executive order to be signed into law to give Christians in Iraq “the chance not just to survive, but live. 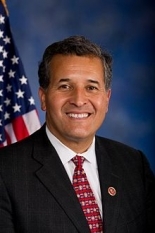 We are so grateful to stand behind Congressman Vargas in his valiant efforts to push this resolution, and we remain steadfast in our commitment to the plight of ethnic and religious minorities throughout the world." Iraq is currently embroiled in a political and religious insurrection stemming from an ISIL-led offensive that began in the Anbar province and has spread to locations such as Mosul, Tikrit and Samarra, engulfing the region in violence and instability. Iraq’s population is approximately 31.3 million with 97 percent identifying themselves as Muslim and approximately 3 percent religious minorities, including Christians, Yezidis, Sabean-Mandaeans, Bahais, Shabaks, Kakais and Jews. Over 500,000 people have been displaced by the current situation in Iraq and reports have surfaced of targeted harassment, persecution and the killing of Iraqi religious minorities by ISIL with little to no protection from the Iraqi government and other security forces. Once ISIL established its control over northwestern Iraq and Syria, it declared a caliphate, warning Christians living under its jurisdiction to convert to Islam, pay a cumbersome religious tax, or be executed. Since this declaration, over 10,000 Iraqi Christians have packed their belongings and fled to neighboring communities in Kurdistan, Syria, Lebanon and Jordan. The last 1,500 families to leave were robbed at an ISIS checkpoint and there are reports that there are no more Christians in Mosul. Rep. Vargas worked with Rep. Jeff Fortenberry (NE-1) and Rep. Anna Eshoo (CA-18), whom had together introduced a similar resolution, to incorporate additional language into the preamble and the resolving clause sections of H.Res. 683 that were originally included in H.Con.Res. 110. The resolution approved reaffirms the House of Representatives’ commitment to promoting and protecting religious freedom around the world and providing relief to minority groups facing persecution. Additionally, it deplores and condemns the religious bigotry, vandalism and destruction of property, and violent attacks on and intimidation of innocent Iraqi civilians by armed extremists. The resolution calls on the United States Department of State to work with the Kurdistan Regional Government, the Iraqi Central Government, neighboring countries, the diaspora community in the United States, the United Nations High Commissioner for Refugees and other key stakeholders to help secure safe havens for those claiming amnesty. Furthermore, it requests the addition of a Special Representative for Religious Minorities to be included in Iraq’s newly reconstructed government. Lastly, the resolution calls on the United States Permanent Representative to the United Nations to work with the United Nations High Commissioner for Refugees on a sustained basis to document human rights abuses against Iraqi civilians and develop an immediate plan to facilitate safe humanitarian access to potable water, health care, fuel, electricity, and basic security for the most vulnerable civilian populations. It also calls upon the Government of Iraq to take immediate steps to protect the safety and constitutional rights of all Iraqi citizens. Vargas represents California’s 51st Congressional District which includes the southern portion of San Diego County including much of East County, all of Imperial County and California’s entire US/Mexico border. Vargas is currently serving his first term in Congress. He represented the 40th California State Senate District from 2010-2012, the 79th California State Assembly District from 2000 – 2006 and served on the San Diego City Council from 1993 – 2000. This country is up to it's eyes in debit and our borders are being over run but Vargas and the rest of Congress has nothing else to do but pass bills to convince terrorists not to do bad things? What a horses behind.